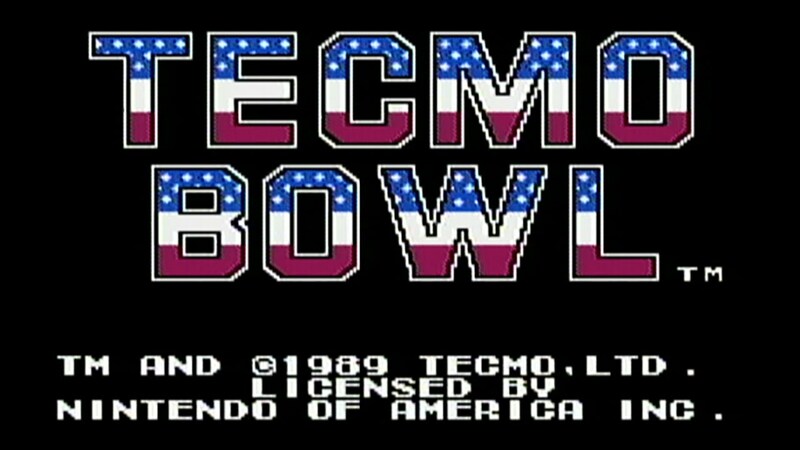 Tecmo Bowl was released for the NES in 1989. 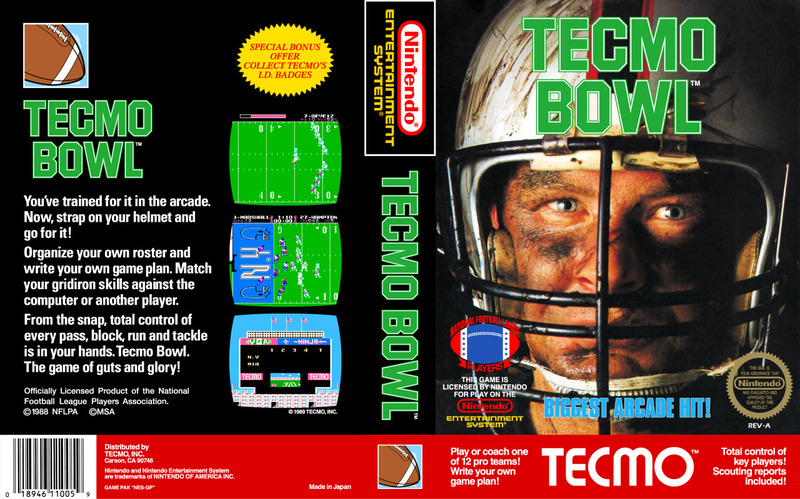 It was developed and published by Tecmo. 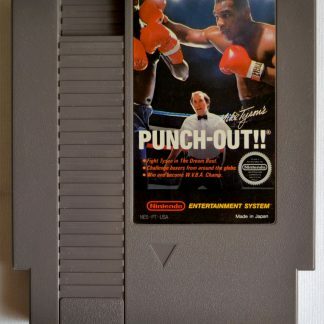 It was originally released for the arcades in 1989. 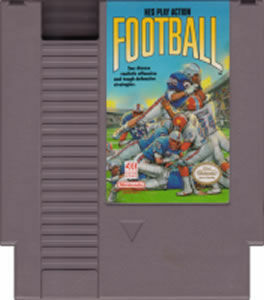 The version on the NES was the first game on a console to feature real life NFL players. 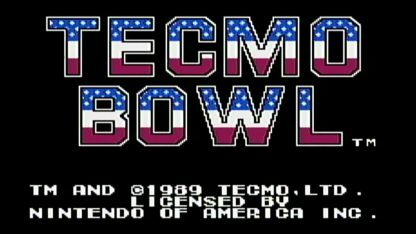 NFL, developed by LJN, was the first to feature the NFL team names, but Tecmo Bowl was more successful. Because of NFL player names and the scarcity of arcade units, the version on NES eclipsed the arcade counterpart, having more popularity. 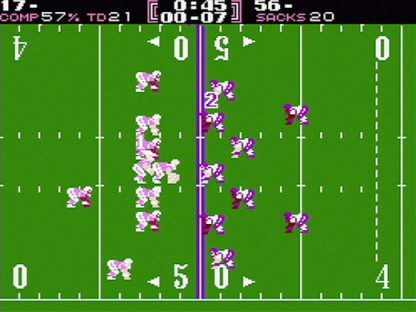 Even though the game has stats and names of NFL players from 1988, gameplay will be limited to mimic real players. 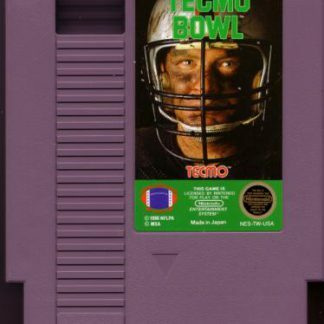 The NES game will only consist of nine players on both sides. The player on offense with the football will try to avoid defenders, and defenders try to avoid the blockers and tackle the player holding the football. 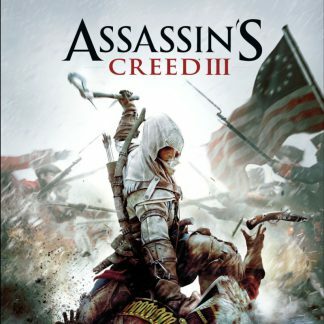 The game will be able to support two players. 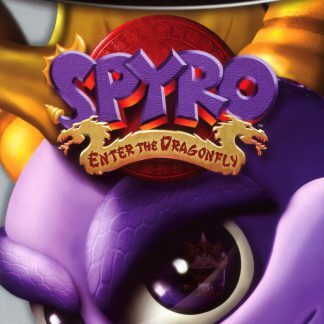 A player will be able to choose one of three modes, which are coach, single player, and two players. 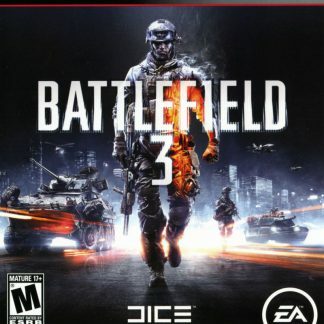 In the single player mode, a player will pick a team to play against a computer team. 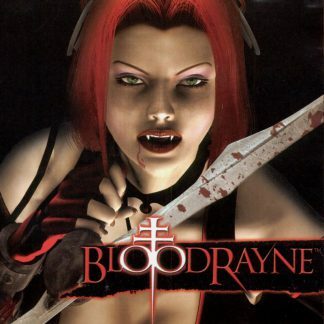 After each game a player wins, the computer controlled team will choose another team, while the player will stay with their original choice. 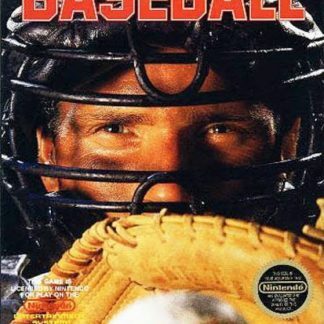 When playing coach or two players, a player and another player will play a game against each other, but the players will only be able to choose plays while in coach mode. the playbook will have four plays on offense. While playing on defense, the player will select a play that is based on what they think the offense chose. If the defense chose the correct play, the offensive line will collapse and the receivers will be well covered, setting up a possible sack or interception. 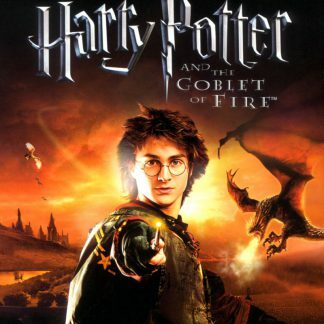 There will be twelve teams, with each having four plays. Most of the teams will have two plays for running and two plays for passing. 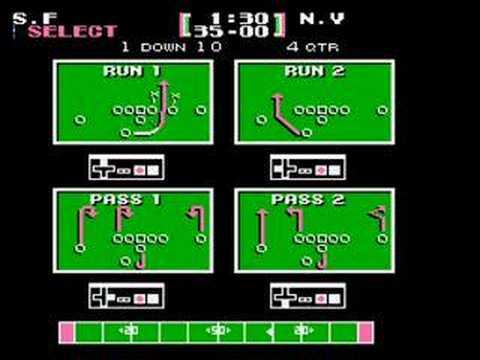 The exceptions to this are Miami and San Francisco, who will have three plays for passing and only one for running. 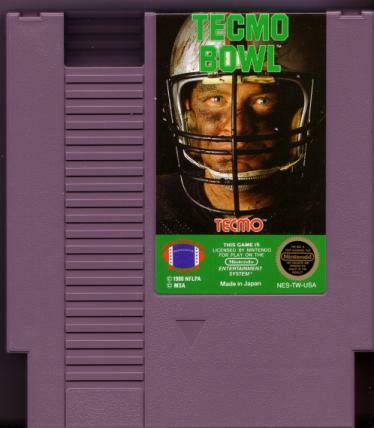 Tecmo could not get the NFL consent to have the real names of the teams. Therefore, the teams will be identified by the home state or city. Every roster, however, will mimic the team from the NFL that is based from the same state or city. 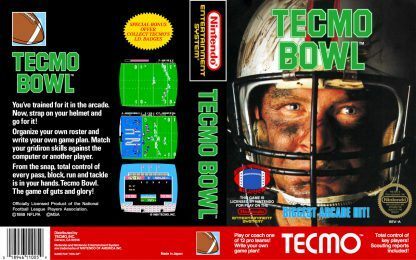 Tecmo Bowl used players from the twelve most popular and best teams. The teams are mimicked are Minnesota, Chicago, New York (the Giants), Dallas, San Francisco, Washington, Los Angeles (the Raiders), Seattle, Denver, Cleveland, Miami, and Indianapolis, with the first six in the NFC and the last six in the AFC. 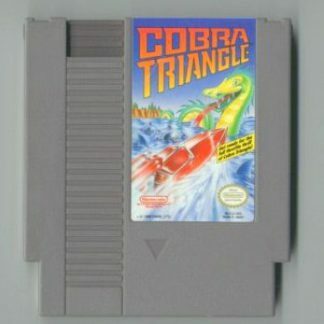 There was two versions for the NES released. The first one released is identified with the gold and black seal of quality. The second one released was identified with the gold and white seal. 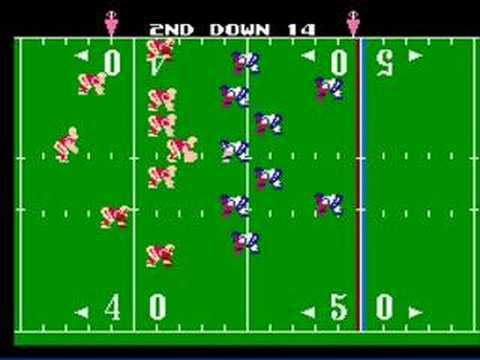 The original release of Tecmo Bowl Indianapolis’s kick returner as Albert Bentley and their running back as Eric Dickerson. The later version released had Indianapolis’s running back as Albert Bentley and their kick returner as Clarence Verdin instead. 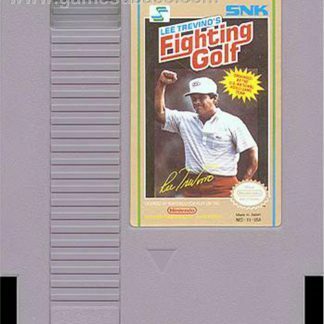 When the game was released in Japan for the Famicom the next year, there were many changes to the rosters to reflect that year it released.